Pear nutrition is probably something that you do not really think about when you are eating one of these delicious fruits. However, they are really good for you and I do not just mean the flavor. They are a wonderful way to get many of the vitamins and minerals you need throughout the day and they are high in dietary fiber. It is important to understand just how good for you they really are because you may be more willing to work them into your diet. If we take the time to think about the dietary fiber it is interesting to know that one five ounce pear will give you 20% of the dietary fiber that you need for the entire day. That is a lot of fiber in one small pear. This is great if you enjoy eating them because you are definitely doing well for your body if you are consuming them on a regular basis. The dietary fiber will help your body decrease any inflammation. This can help you tremendously if you are suffering from conditions such as diabetes. You will also find vitamins A and C within the pear and you will find the protein that your body needs as well. Vitamin C helps your body fight off infections. Many people do not realize this. Consuming pears and obtaining the vitamin C that is inside is a great way to help your body remain healthy and fight off any pending infections that could make you ill. You may also want to consider giving these to your children a few times a week in order to help keep them healthy as well. Your child does not have to know it is good for them just as long as you do. They may really enjoy the sweet taste of a fresh pear. Another vitamin that deserves attention when talking about pear nutrition is vitamin K. This is the vitamin that is used by the body to help clot your blood when you are injured. This is needed to help stop bleeding and to help your body heal. You may also be surprised to know that vitamin K has been known to help your body fight against bone density loss and osteoporosis. If you are worried about getting older and concerned about osteoporosis, you may want to think about consuming more pears. If you purchase a pear at the store and you notice that it is hard, you need to leave it sitting on your counter for a few days. You want the pear to be soft. That is how you will know that it is ripe. When you are ready to consume this fruit you will need to wash it lightly and leave the skin on it. The skin is what contains much of the vitamin C that adds to pear nutrition. It is important to eat the skin as well as the fruit inside. You should think about that the next time you open a can of sliced pears; there is no skin in there. That just goes to show that fresh is always better. 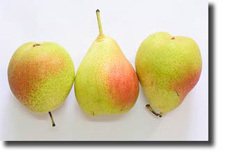 I hope you learned more about pear nutrition than you knew when you began this article. I hope that you are motivated to consume more pears in the future and you are willing to make them a part of your diet. In today’s society, with everyone eating fast food, it is always good to enjoy some fresh fruit. I think it is easy to see why that is a benefit. So, the next time you are at the store, stop in the produce section and pick up some pears.